Pocket Casts, the popular podcasting app, has just added a new feature that will give you a list of podcasts that people near you are listening to. The "Nearby" feature will display a list of the most popular podcasts in your vicinity, giving you a glimpse of what everyone loves listening to. If you don't fancy sharing what you're listening to, don't worry, as you need to enable the sharing feature before broadcasting your podcast choices. This innovative new feature is an interesting way to discover new podcasts, and you can find out what everyone in your area is listening to by going to the "Discover" tab and tapping on "Nearby". 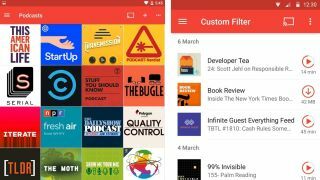 We've got some bad news for iOS owners though, as currently the Nearby feature is only available on the Android version of the Pocket Casts app. However the developer of Pocket Casts, Shifty Jelly, has promised a "massive" update to the iOS app is incoming, so Apple fans will hopefully getting the feature soon.